Entirely comforting. Tender cauliflower & broccoli florets. Mature cheddar & red Leicester. Seeded spelt shortcrust pastry. Camilla's ciabatta & thyme crumb. Vegetarian Society Approved. 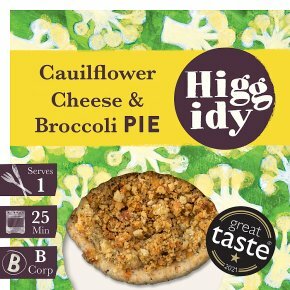 A monday-night... Morale-boosting dinner A cauliflower cheese pie or two Some thick slices of good ham A whatever's-in-the-fridge salad A simple yet satisfying start to the week. This pie is ready to eat cold but tastes best heated up. Preheat oven to 180°C/350°F/Gas Mark 4.Remove all packaging & place on a tray on the middle shelf of the oven for about 25 minutes. This is a guide only (some ovens vary). Do not reheat once cooled.